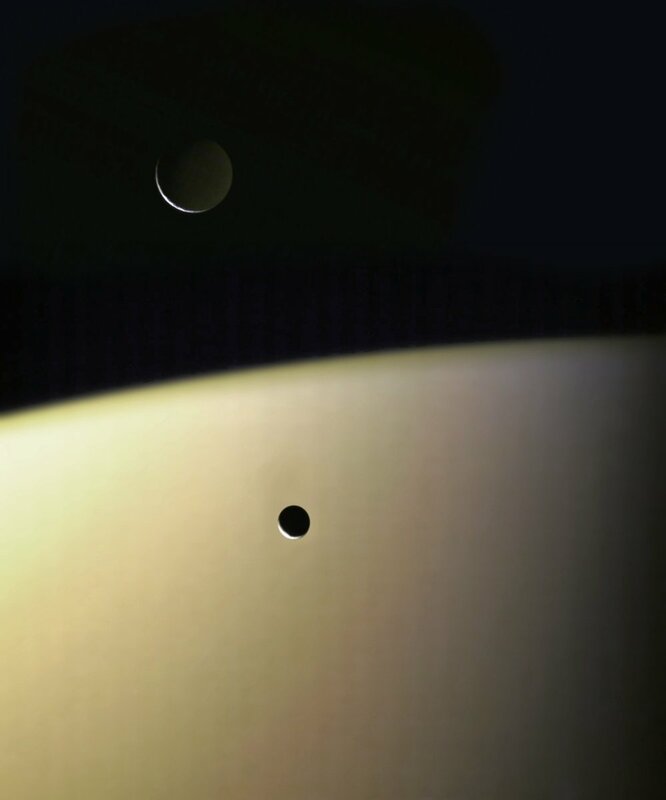 Sort of getting over the whole, “hey, we got two moons in the same frame” thing on the Cassini mission. But this one of Tethys ducking behind Titan’s thick hazy atmosphere kind of looks like a scene from a Star Wars movie. Emily Lakdawalla recently posted some images from the Cassini raw image database and I noticed that she had posted 2 similar images taken the same day. One had Saturn’s disc over exposed and the other had Saturn exposed much better with the rings too dark and lacking detail. These crescent images often make it difficult for Cassini’s cameras to get a single exposure with both elements with proper exposure because Saturn’s disk is so much brighter than the back-lit rings. So i retrieved the images from the same day, recompiled them, did a little manual color balancing based on one of Gordan Ugarkovic’s recent crescent Saturn images and finally merged the two elements together. So, in reality the rings were taken at a slightly different time than Saturn’s disc was. However, since Cassini takes it’s color images one filter at a time (red, green and then blue), that is really true of any color image compiled from the mission database. Also visible in the image is a small crescent Tethys and Titan’s shadow on the cloud tops. Gordan’s reworking of images taken October of 2005. Strikingly gorgeous. I think we have at least one impressive dramatic color image of each of Saturn’s major moons with Saturn or its rings as backdrop at this point. Its Titan up top and Tethys below. One of the mid-sized moons of Saturn, Tethys, is thought to be composed almost entirely of water ice. Its most remarkable features are Odysseus, a 400 km wide crater and the Ithaca Chasma a 2,000 km long valley that runs across 2/3 of Tethy‘s globe. Those features are not visible in this image, but what is visible is the slight color variation which almost appears as a “dusting” of color on a largely grey body. A curious feature especially considering the radical color variation found at Iapetus. Perhaps this discoloring is a more subtle result of the same event which caused the strange color variation on Iapetus? The moon Tethys is pictured drifting across Saturn’s disc. Tethys is one of 3 medium sized moons (including Rhea and Dione) which are largely composed of ice with small amounts of rock and whose features consist mostly of craters. Tethys does have two outstanding features which are a huge 400km impact crater whose diameter is about 2/5 that of Tethys itself, as well as a giant 2000km valley that stretches across 3/4 of Tethys diameter. IMAGE NOTE: This image was not altered other than extending Saturn’s rings to fill the page on the upper right side. The original image was in square format so the subtle ring outlines were more cropped than seen here.